Congratulations to Danelle Oliver and NAFC Ferndelle's Flying Cloud of HCR MH AJP AXP. Acey completed the 2013 National Amateur Championship without a placement but came back in 2014 and won the National Amateur Championship. Danelle Oliver with Acey. This picture was at the Missouri Club's field Trial. This team went to the 2013 National Amateur and completed the National. Acey was bred by Mark Nix. Placements from our previous trial can be found at www.essft.com under field trial placements. Camping is available on site with RV hookup's. Please RSVP David Sanford if you are going to camp in your RV. 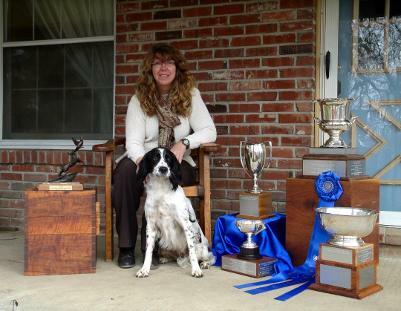 Congratulations to Danelle Oliver and Acey for completing the 2013 National Amateur Championship. Completing the trial is quite an accomplishment. Only 14 dogs out of 113 starters finished the trial. Acey was bred by Club member, Mark and Racine Nix. Also, congratulations to David Sanford for running his 4 dogs through 3 series and then 3 of his dogs through the 4th series. That is 15 series that David ran with his dogs in the National Amateur and the dogs did not do anything to eliminate themselves. There were just "cleaner" dogs that went to the 5th series. Congratulations on a job well done. 2 of the dogs that David ran was bred by David and Missy Sanford.